Customer Sales Associate ensures optimum customer satisfaction by discharging excellent customer sales services, the job tasks commonly listed in a Customer Sales Associate Resume include handling on daily basis customers, identifying the needs and requirements, offering advice, answering queries, packing items, maintain in stock products, actively interact with customers in store, close sales and collect payments. 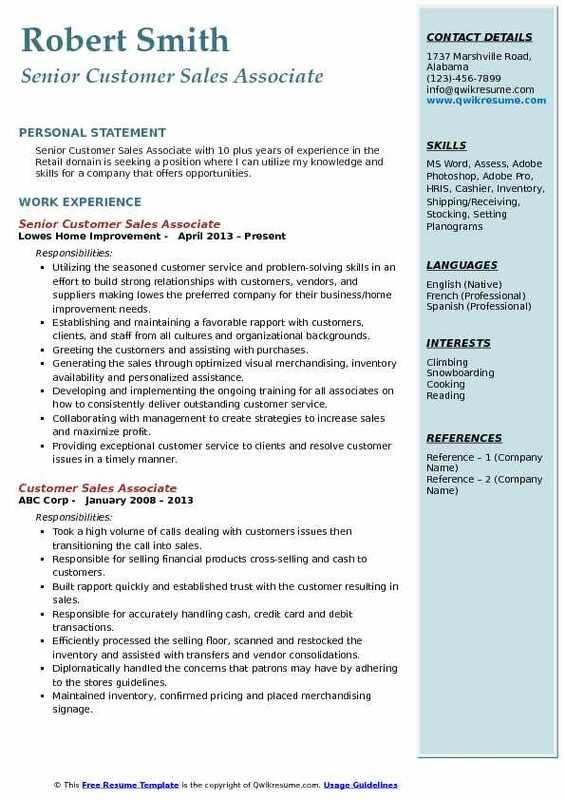 Successful resume for a Customer Sales Associate job post depict skills such as selling ability, familiarity with inventory, hands-on experience in POS transactions, sound observation spirit, reasoning ability, mathematical skills, strong negotiation skills, and computer literacy. 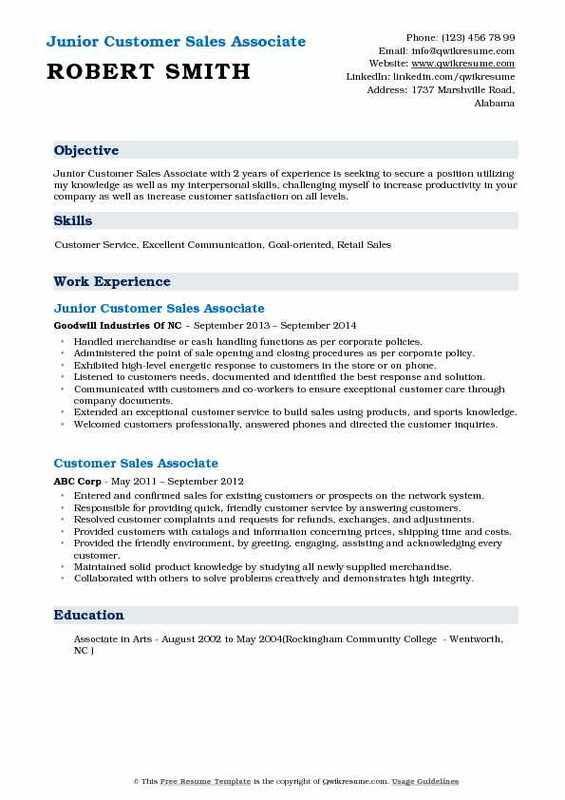 A degree in Sales, marketing or Communication is the most common qualification for this job post, although many employers choose Customer sales associate based on experience and portfolio. 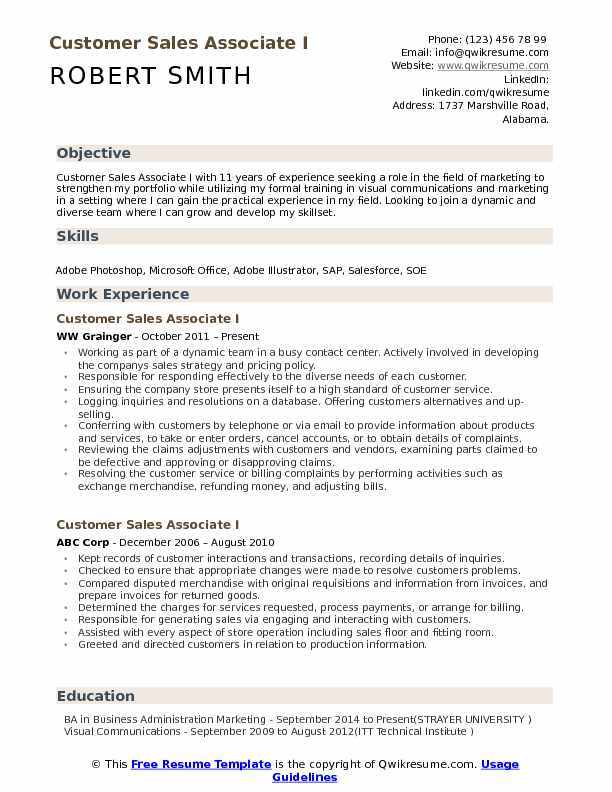 Summary : Customer Sales Associate I with 11 years of experience seeking a role in the field of marketing to strengthen my portfolio while utilizing my formal training in visual communications and marketing in a setting where I can gain the practical experience in my field. Looking to join a dynamic and diverse team where I can grow and develop my skillset. Working as part of a dynamic team in a busy contact center. Actively involved in developing the company's sales strategy and pricing policy. Responsible for responding effectively to the diverse needs of each customer. Ensuring the company store presents itself to a high standard of customer service. Logging inquiries and resolutions on a database. Offering customers alternatives and up-selling. Conferring with customers by telephone or via email to provide information about products and services, to take or enter orders, cancel accounts, or to obtain details of complaints. Reviewing the claims adjustments with customers and vendors, examining parts claimed to be defective and approving or disapproving claims. Resolving the customer service or billing complaints by performing activities such as exchange merchandise, refunding money, and adjusting bills. Reviewing the warranty terms to determine whether a particular loss is covered under warranty. Summary : Customer Sales Associate with 13 years of experience is seeking an entry level sales position with room for growth that challenges me with marketing strategies and customer service in a team-oriented sales environment. Assisting the customers on the phone and at the counter in the selection of the product by effectively communicating product and service offerings. Using the SAP system to provide information on pricing, availability, and alternate product selection to complete customer transactions. Increasing the revenue by going after additional sales by utilizing effective probing and listening skills. Guiding the customers to other internal resources such as technical support, credit, Grainger parts and sourcing or sales as necessary. Managing high volume warehouse area for items 3 times picked or more to ensure quicker service for customers. Managing the monthly safety inspections for the entire facility to ensure a safe work environment for all employees. Collaborating with sales and branch partners to effectively support and manage vendor managed inventory programs at customer facilities including hospitals and high tech manufacturing. Establishing and maintaining strong relationships with customers in order to assist sales associates in reaching quarterly goals by adding and maintaining vendor managed inventory programs. 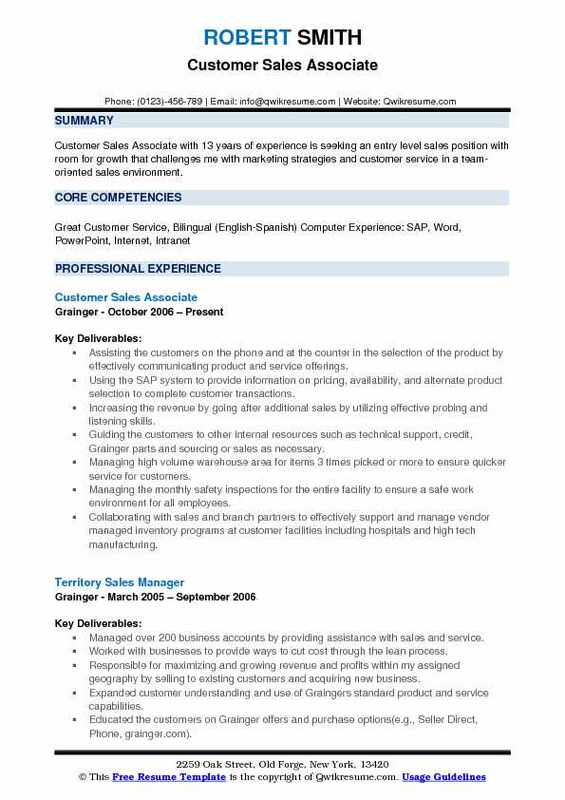 Summary : Senior Customer Sales Associate with over 8 years of professional experience. A dependable individual with a strong work ethic. Possess good verbal and problem-solving skills. Ability to maintain a keen attention to detail and handle multiple tasks in a timely manner; and Knowledge of Microsoft Word, Excel, PowerPoint, Internet and Outlook. 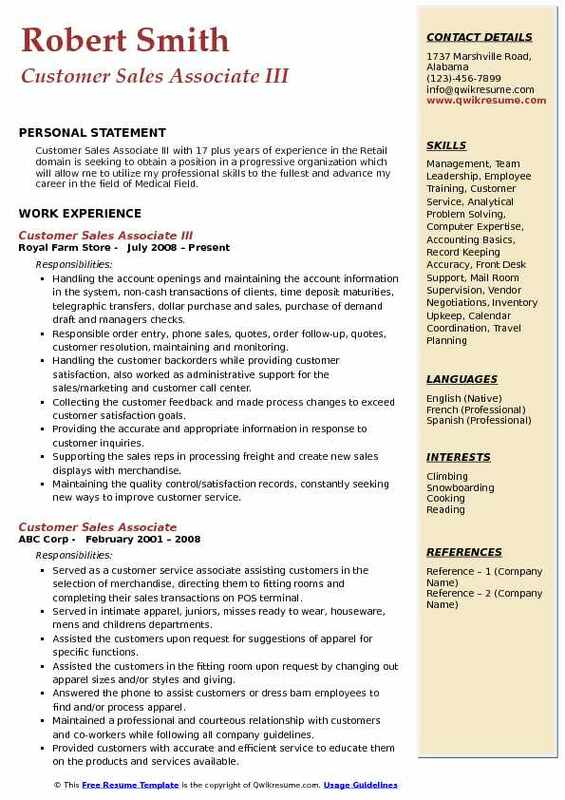 Skills : Computer, Data Entry, Billing, Customer Service, Communication, Detail Oriented, Email, Filing, Faxing, Keyboarding, Microsoft Office, Microsoft Word, Management, Powerpoint, Typing, Time Management. Responsible for managing, building and maintaining strong relationships with customers while executing financial transactions in the areas of pricing and billing. Analyzed complex customer problems/situations to determine the resolution that is in the spirit of the customer's driven partnership. Advised resolutions to inquiries; making decisions in alignment with business strategies and goals. Managed customer pricing mechanisms, discounts, and rebates for products and solutions. Tracked and resolved errors in the financial system, developed a process to prevent recurring issues. Proactively monitored and audited billing documents for accuracy and timeliness. Collaborated with credit and receivables group on outstanding receivables to help minimize revenue leaks. Analyzed data and reports, proactively advised customers and sales representatives on sales margins. Advocate online systems partnership with functionality in support of customer needs. Summary : Customer Sales Associate II with 16 plus years of experience in the Retail domain is seeking a career where exceptional selling skills and the ability to maintain inventory will help to provide expedient and proficient customer service to help ensure customer loyalty and retention while consistently meeting and exceeding sales goals and product quotas. Exercised decision-making skills to enhance each customers experience. Supported new hires through mentorship. Collaborated with the team during the morning and closing meetings. Participated in ongoing staff education and sharing of product knowledge. Worked with the visual team to create new prototype displays to be used company wide. Established customers information and sales quotas daily. Offered additional services or options. Helped customers identify products that best suited their needs. Frequently check the stock to fulfill customers requests. Maintained the store's appearance. Sorting and organizing receipts from each register. Performed store operations in receiving, merchandising, and replenishing product, as well as displaying product. Drove sales, and identified the areas of improvement of key performance indicators. Summary : Senior Customer Sales Associate with 10 plus years of experience in the Retail domain is seeking a position where I can utilize my knowledge and skills for a company that offers opportunities. Utilizing the seasoned customer service and problem-solving skills in an effort to build strong relationships with customers, vendors, and suppliers making lowes the preferred company for their business/home improvement needs. Establishing and maintaining a favorable rapport with customers, clients, and staff from all cultures and organizational backgrounds. Greeting the customers and assisting with purchases. Generating the sales through optimized visual merchandising, inventory availability and personalized assistance. Developing and implementing the ongoing training for all associates on how to consistently deliver outstanding customer service. Collaborating with management to create strategies to increase sales and maximize profit. Providing exceptional customer service to clients and resolve customer issues in a timely manner. 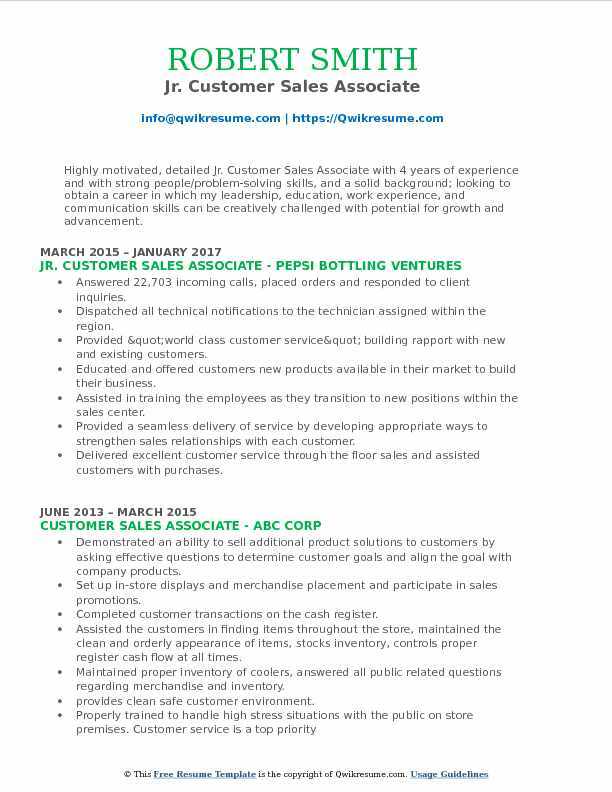 Objective : Junior Customer Sales Associate with 2 years of experience is seeking to secure a position utilizing my knowledge as well as my interpersonal skills, challenging myself to increase productivity in your company as well as increase customer satisfaction on all levels. Handled merchandise or cash handling functions as per corporate policies. Administered the point of sale opening and closing procedures as per corporate policy. Exhibited high-level energetic response to customers in the store or on phone. Listened to customers needs, documented and identified the best response and solution. Communicated with customers and co-workers to ensure exceptional customer care through company documents. Extended an exceptional customer service to build sales using products, and sports knowledge. Welcomed customers professionally, answered phones and directed the customer inquiries. Finished paperwork and transactions as per company policies and procedures. Determined the best method to resolve problems to ensure customer satisfaction and company. Occasionally visited external customers to better understand their needs and potential sales. Objective : Highly motivated, detailed Jr. 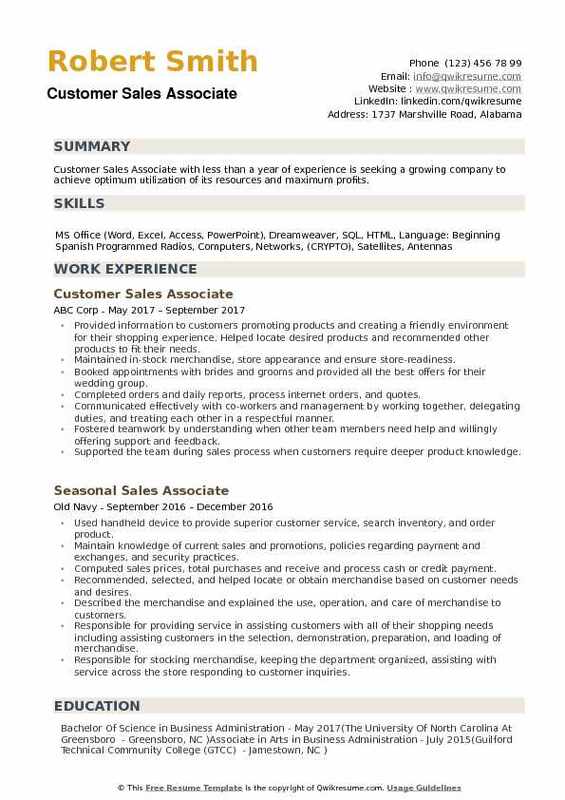 Customer Sales Associate with 4 years of experience and with strong people/problem-solving skills, and a solid background; looking to obtain a career in which my leadership, education, work experience, and communication skills can be creatively challenged with potential for growth and advancement. Answered 22,703 incoming calls, placed orders and responded to client inquiries. Dispatched all technical notifications to the technician assigned within the region. Provided "world class customer service" building rapport with new and existing customers. Educated and offered customers new products available in their market to build their business. Assisted in training the employees as they transition to new positions within the sales center. Provided a seamless delivery of service by developing appropriate ways to strengthen sales relationships with each customer. Delivered excellent customer service through the floor sales and assisted customers with purchases. Performed inventory control/audits and made special orders, refunds, and returns of damaged goods. Trained new team members on sales techniques, client protocols, and store policies. 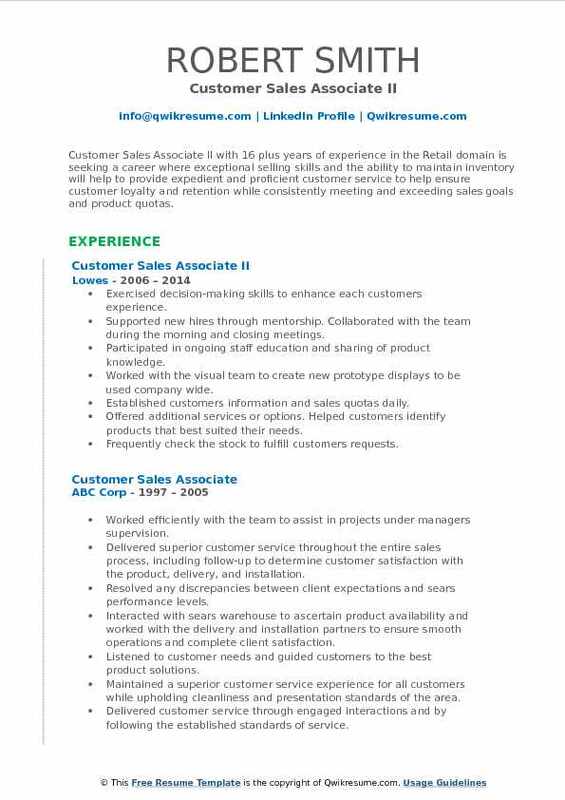 Summary : Customer Sales Associate offering 7+ years of diversified experience. Highly successful at upselling and promoting new products. Excellent communication skills forged by over a decade of providing customer serivce and creating relations. Assisted the bridal couples and other rental customers by preparing and presenting proposals, sales quotes and recommending coverages based on customer needs to their personal formal style. Head appointed associate for operating phone calls dealing with sale/rental orders and assist operational manager with bridal calls. Assisted the wardrobes with sales stacks for their customer's personal needs. Measured the customer for the correct size for upcoming events including proms, weddings and high school fashion shows. Attended sales fashion shows, sales meetings or educational activities to stay up-to-date on the latest developments, trends, regulations in the marketplace. Created and maintained computer files and suspense for follow-up action. Handled the escalated level customer service concerns with satisfaction scores above 97%. Handled consumer accounts with regards to appointment scheduling, customer service satisfaction relations, and sales. 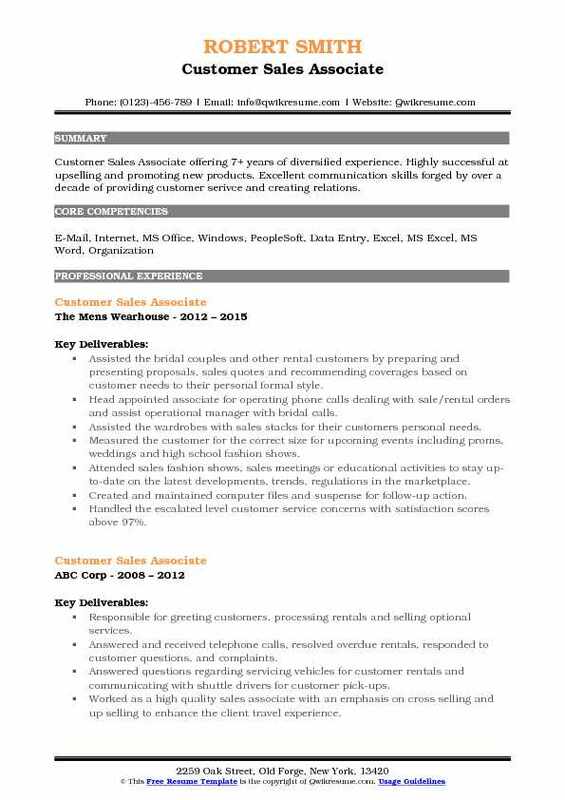 Summary : Customer Sales Associate III with 17 plus years of experience in the Retail domain is seeking to obtain a position in a progressive organization which will allow me to utilize my professional skills to the fullest and advance my career in the field of Medical Field. Handling the account openings and maintaining the account information in the system, non-cash transactions of clients, time deposit maturities, telegraphic transfers, dollar purchase and sales, purchase of demand draft and managers checks. Responsible order entry, phone sales, quotes, order follow-up, quotes, customer resolution, maintaining and monitoring. Handling the customer backorders while providing customer satisfaction, also worked as administrative support for the sales/marketing and customer call center. Collecting the customer feedback and made process changes to exceed customer satisfaction goals. Providing the accurate and appropriate information in response to customer inquiries. Supporting the sales reps in processing freight and create new sales displays with merchandise. Maintaining the quality control/satisfaction records, constantly seeking new ways to improve customer service. Educating the consumers on the payment protection plan and how to use benefits of the plan. Establishing and maintaining the effective working team relationships with all support departments. 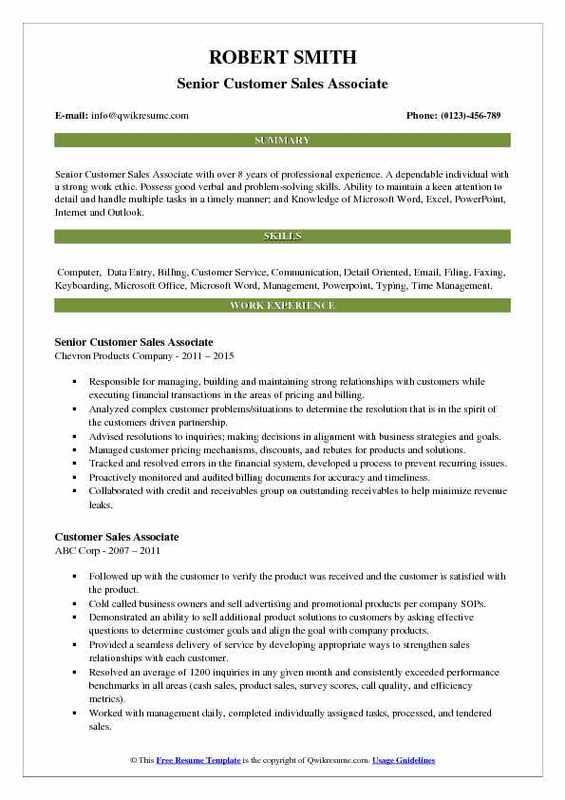 Objective : Customer Sales Associate with less than a year of experience is seeking a growing company to achieve optimum utilization of its resources and maximum profits. Provided information to customers promoting products and creating a friendly environment for their shopping experience. Helped locate desired products and recommended other products to fit their needs. Maintained in-stock merchandise, store appearance and ensure store-readiness. Booked appointments with brides and grooms and provided all the best offers for their wedding group. Completed orders and daily reports, process internet orders, and quotes. Communicated effectively with co-workers and management by working together, delegating duties, and treating each other in a respectful manner. Fostered teamwork by understanding when other team members need help and willingly offering support and feedback. Supported the team during sales process when customers require deeper product knowledge. Sold or arranged for delivery, insurance, financing, or service contracts for merchandise.